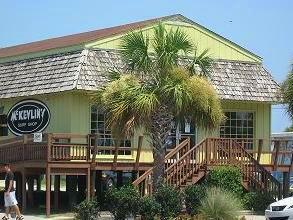 Folly Beach is located just 10 minutes south of downtown Charleston, on the Atlantic Ocean side of James Island. 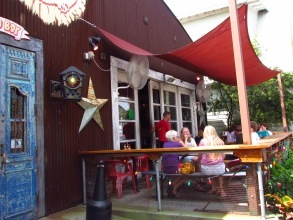 The atmosphere and home styles are reminiscent of Key West, with a strong island culture. Known for its laid back style and surfing competitions, Folly Beach is a favorite among locals and tourists alike. Despite its enormous popularity, it's still the Charleston beach that is most affordable for buying real estate. Folly Beach is located about 10 minutes south of downtown Charleston. Although you'll find a range of things to do without ever having to leave the island, a 10 minute car ride will take you to all of the shopping and restaurants that can be found in historic downtown Charleston. In fact, Folly Beach is one of the closest beaches to peninsular Charleston. The most affordable Folly Beach real estate options are condos and town homes. These homes scattered around Center Street (the main road coming onto the island) have an ideal location because they're just a short walk to the beach and to shops and restaurants. Beachfront homes are, of course, the most sought after and therefore the priciest. However, if you don't see a home on the beachfront in your price range, the homes several rows back are also great options. 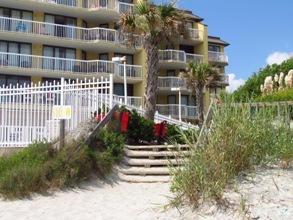 Public beach accesses are scattered throughout the ocean side of Folly Beach, making your short walk to the beach very convenient. Most of the commercial development is concentrated in the center of the island, leaving the residential sections on the north and south sides of the island for the enjoyment of beach goers. 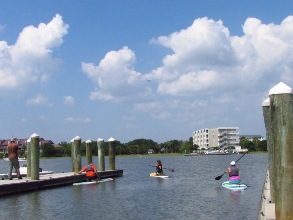 The residential community on Folly is a combination of vintage single-family homes and newer condominium developments. The renewed interest in this area and quirky zoning ordinances have allowed for a great mix of types, styles, and ages of homes on Folly Beach. In price ranges under $600K, you'll find plenty of condos and townhouses located towards the back of the island. Many of these are marshfront and overlook the waterway that people often refer to as Folly River. You'll also find several condo communities just across the bridge on the mainland. Although these are not located on the island of Folly, they're a short bike ride to the beach. Plus, several of these communities have amenities such as pools. Along with traditional beach activities such as boating, fishing, and sunbathing, Folly Beach also has a host of unique sights and activities that impress both visitors and residents alike. Beach shops and restaurants line Center Street, which is the commercial hub of the island. 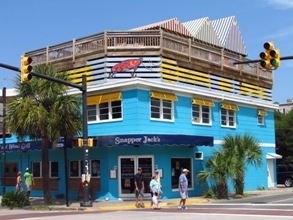 You can get seafood at Snapper Jack's or Tex-Mex at Taco Boy (shown below). If you're looking for entertainment off the island, the short five minute drive to James Island will grant you easy access to grocery stores, Wal-Mart, and more shops and restaurants. Plus, downtown Charleston is just a ten minute drive from Folly Beach. Of Charleston's six beaches, Folly is the most convenient for getting to downtown Charleston. There, you'll find shopping on King Street, museums, and more historic sites than you can fit into a day of sight seeing. Folly Beach is perhaps known best for surfing. Every month during the summer, Folly Beach hosts several surf competitions that draw large crowds to watch. On any given day you'll find the area known as "the Washout" full of surfers and young people enjoying the beach. In fact, most of the College of Charleston students prefer to go to Folly Beach because it's the closest to downtown. The north and south parts of Folly Beach are county parks where there are no homes, so you'll find fewer people on the beach. 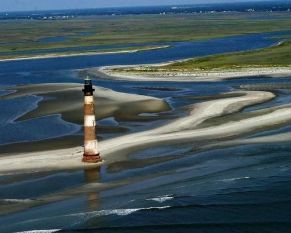 The Morris Island Lighthouse, visible from the northeast end of Folly Beach and some 300 yards offshore, is a popular historic attraction. The scenic beauty of this part of the island draws kayakers, fisherman, boaters, windsurfers, visitors, and home owners alike. When it was built in 1876, it had black and white stripes painted on its brick exterior. It also originally had fifteen buildings surrounding it for the keeper and his family. When the lighthouse was automated in 1938, most of the buildings were rendered unnecessary and were either torn down or relocated. Although the lighthouse has since been decommissioned, this structure is a reminder of Charleston's longstanding nautical heritage. It's also one of only two lighthouses in Charleston (the other is on Sullivan's Island). Few South Carolina lighthouses have such a following of preservationists and supporters who keep the structure sound. Folly Beach homes range from character beach houses to multi-million dollar ocean front estates. The majority of the homes on the beachfront of Folly are single-family, but there are a few ocean front condos near the Folly Pier. Real estate prices vary greatly on Folly, depending on whether the properties are waterfront homes (marshfront, ocean front, river front) or interior homes. The interior properties also vary, depending on the distance from the property to the ocean. Some of the marshfront properties have private boat slips, but there is also a public boat ramp on the right as soon as you enter the island. So, know that you can still have easy boat access even if your home or community doesn't have its own facilities. 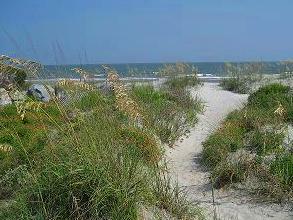 Another important factor for the value of real estate on Folly Beach is the condition of the property. Some Folly Beach properties are older homes built in a time when beachfront properties weren't considered luxury properties. So, some of the homes on Folly Beach are old shabby beach houses. These older homes give Folly Beach its character and offer buyers affordable real estate on Folly Beach.